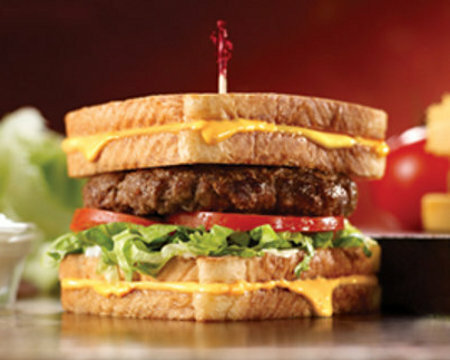 Speaking of making me a sandwich, Friendly’s just introduced their newest sandwich of mass destruction. The Grilled Cheese Burgermelt is 1500 hundred calories of magical yumminess. Two whole grilled cheese sandwiches replace the buns of this burger. Stuffed in between these sandwiches is a thick 100% Black Angus beef patty, served with lettuce, tomato and mayo. Umm, can you even imagine how awesome this would be with a few strips of bacon? I would so try this if I wasn’t so sure that my heart would explode the second the plate was set in front of me.